Delray Beach City Hall is located at 100 NW 1st Avenue, Delray Beach, FL 33444; phone: 561-243-7010. Photo: John and Elizabeth Shaw Sundy House, ca. 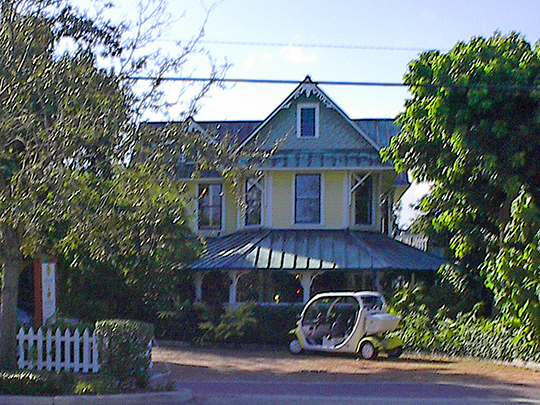 1902, 106 South Swinton Avenue, Delray Beach, FL. Listed on the National Register of Historic Places in 1992. Photographed by User:Donal Albury (own work), 2007, [cc-by-3.0 (creativecommons.org/licenses/by/3.0)], via Wikimedia Commons, accessed February, 2014. Delray Beach, settled in 1901, is a tourist resort and the center of an area producing beans, peppers, tomatoes, sugar cane and citrus fruit. Many Michigan farmers of German ancestry have bought farms in the vicinity. On Atlantic Avenue is Delray Country Club and Golf Course. City Park provides picnic and recreation grounds. Municipal Beach, at the foot of Atlantic Avenue, offers surf bathing and fishing.